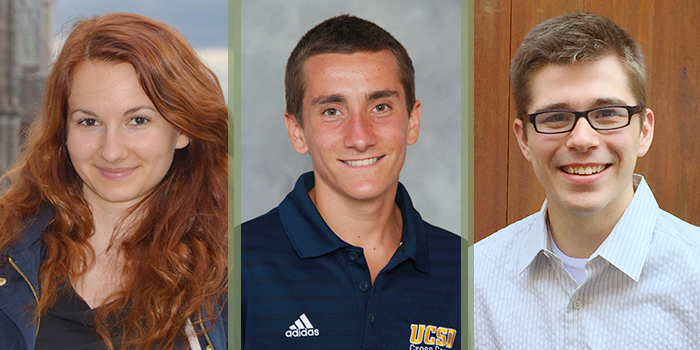 The Thornton Tomasetti Foundation has named Denisa Buzatu, Zachary Caamano-Withall and Adam Jesberger recipients of its fourth annual National Scholarship awards. Currently enrolled in Princeton University, University of California, San Diego and Pennsylvania State University, respectively, the three students will each receive $10,000 to pursue a master’s degree in structural engineering or architectural engineering. The scholarship winners were chosen from 14 universities across the country. Candidates were nominated by a university dean or department chair, and graded on factors such as career goals, academic accomplishments, and demonstrated interest in the integration of structural engineering and architecture. Recipients must intend to make an impact on the structural design of buildings, and practice structural engineering in the building field upon completion of their degree requirements. The Thornton Tomasetti Foundation jury, which reviewed the submissions, consisted of Foundation Board of Governors member Wayne Stocks, a managing principal in Thornton Tomasetti’s Washington, D.C. office, senior principals John Abruzzo of San Francisco, Calif., Faz Ehsan of Chicago, Ill., and Anjana Kadakia of Newark, N.J. and Director Tanya de Hoog of London, U.K.
Ms. Buzatu interned at École des Ponts ParisTech in summer and completed a senior thesis focusing on the shape-changing behavior of a triangulated hinged plexiglass plane. Zachary Caamano-Withall is a student at the University of California, San Diego and is enrolled in the school’s five-year integrated program that leads to both bachelor’s and master’s degrees in structural engineering. Mr. Caamano-Withall is one of the top-ranked students in his class. He served as a structural engineering intern with Tobolski Watkins Engineering and Interra Engineering, both in San Diego. He also competed in the 2013-14 ASCE Concrete Canoe Design Competition. Mr. Jesberger is pursuing dual architectural engineering degrees in the integrated bachelor’s/master’s program at Pennsylvania State University, and is currently in his fifth year. He has been a member and served as treasurer of the Student Society of Architectural Engineers (SSAE), the Penn State chapter of the Architectural Engineering Institute (AEI). He has also served as a student mentor for underclassmen enrolled in the architectural engineering program. He was the lead structural engineer on a Penn State team that recently submitted a project entry to the annual National AEI Student Design Competition. The team won in the construction development category. Mr. Jesberger is a two-time recipient of the Evan Pugh Scholar Award, a Penn State recognition for juniors and seniors in the upper 0.5 percent of their respective classes. The Thornton Tomasetti Foundation, a tax-exempt, nonprofit organization established in February 2008, has two primary missions including funding fellowships, scholarships and internships for undergraduate students, and those planning to pursue graduate studies in building engineering, design or technology and providing financial support for individuals and organizations pursuing philanthropic activities related to building engineering, design or technology. Key elements of the program are college scholarships, traveling internships, and grants to, and partnerships with nonprofit organizations. © 2016 Thornton Tomasetti Foundation. All Rights Reserved.